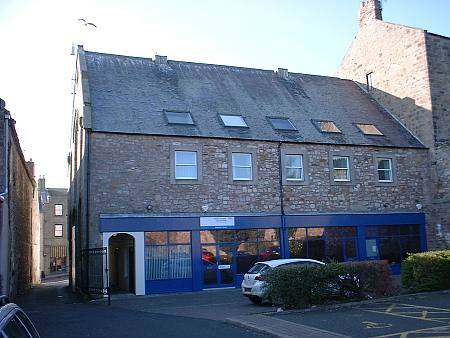 The early history of theatrical performances in and around Berwick can be traced back to the mid-18th century when visiting companies would take over existing premises for their temporary purpose. John Fuller, in 1799, wrote: “Theatrical performances have occasionally been exhibited in Berwick for a great number of years past, sometimes in the Town Hall, and sometimes in a house in Golden Square.” (The History of Berwick upon Tweed. Edinburgh,1799. p. 450.) Berwick’s first dedicated theatre appeared in 1794. Stephen Kemble, then manager of the Theatre Royal in Newcastle and member of a prominent theatrical family, constructed it in the yard behind the King’s Arms on Hide Hill. This theatre “is usually opened a week before the commencement of Lamberton Races (held near 5 miles to the north of the town) in the first week of July, and continues so three or four weeks.” (Thomas Johnstone. The History of Berwick upon Tweed, and its vicinity. Berwick-upon-Tweed History Society, 2004.) This building was destroyed in a fire in January 1845. 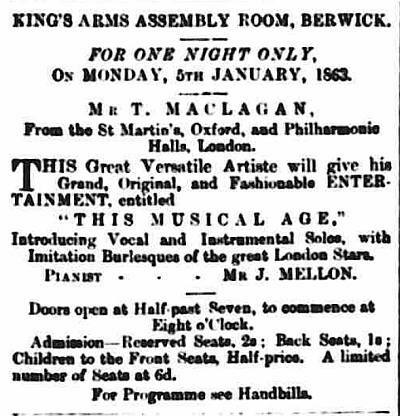 An advert in the Berwick Advertiser in 1863 for one of the musical events at the Assembly Room. After the 1845 fire, the Assembly Room at the King’s Arms in Berwick, which survives to this day, was built on the site of Kemble’s theatre, and it served for a variety of purposes including balls, auctions, lectures, and public meetings; theatrical performaces may have been only an occasional event. Meanwhile, in 1849 another theatre opened for a while in Upper Ravensdowne. “The building is an open court, nearly at the head of the street, and its character is indicated by a projecting gas lamp having engraven on its glasses the word ‘theatre’. The interior arrangements consist of boxes, pit and gallery, with orchestra and stage. None of these are very capacious but in harmony with each other; it is well lighted, by gas, and throughout papered and decorated, certainly in our opinion in a style more gaudy than neat… Though [it] is not all that we could desire our community to possess in the way of a habitation for the Muses, it may possibly rekindle the enthusiasm for theatrical amusements, and ultimately lead to something better.” (Berwick Advertiser, 13 January 1849, p.5.) It is unclear how long it continued in business. Although from this period onwards, the Assembly Room faced competition as a public venue from the new Corn Exchange, it received a dramatic endorsement in 1861 from Charles Dickens when he was staying at the hotel to give a lecture in the town (see the Corn Exchange, below). Dickens described the Assembly Room as “very snug” and “capable of holding 500 people”. And people arrived there in large numbers to hear him speak. This engraving of the recently opened Corn Exchange appeared in the Berwick Advertiser on 4 December 1858 (Berwick Record Office). 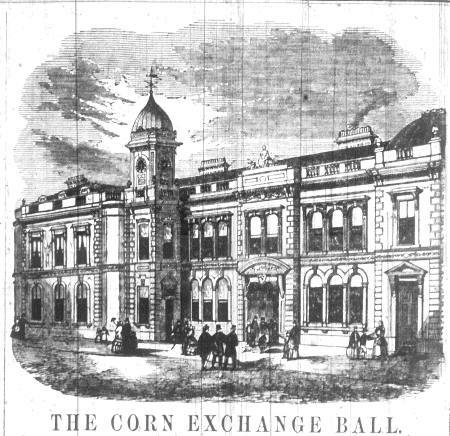 The Corn Exchange opened on Monday 28 June 1858. It was designed by John Johnstone, a Scottish-born architect based in Newcastle. Despite any shortcomings, the Corn Exchange became a principal venue for many kinds of performances at least until the First World War, especially for musical events, performed either by local people or by touring companies, though less frequently for theatrical shows. From 1898 some of the earliest cinema screenings in Berwick were presented at the Corn Exchange (though the very first of these was actually at the Queen’s Rooms – see below). Initially moving pictures were often shown in the context of illustrated lectures about foreign travels or reports of news events such as the great London procession for Queen Victoria’s Jubilee or the progress of the Boer War. It was also common for short films to be included in touring variety shows alongside singers, magicians and acrobats, and they were also incorporated into the visual spectacles of Poole’s Myriorama which visited Berwick on several occasions. THE HISTORY OF THE CORN EXCHANGE in Berwick can be followed in a series of transcripts of articles and advertisements from the Berwick Advertiser, commencing from 1856. Click the link above to see the index of downloadable PDF files. This photograph of Anderson’s Court, formerly the Queen’s Rooms, was taken in 2012. In the upper right corner can be seen the side of the King’s Arms Assembly Rooms which it abuts. On the extreme left of the picture, the side of the Salmon Inn Hall, probably used afterwards as the Central Picture Hall, is visible (but now demolished). Photo: FBDMA. Film screenings continued here intermittently until the early 1920s, though the venue was principally used for other public events. Although the Queen’s Buildings on Hide Hill were demolished in the 1920s, the Queen’s Rooms survive today under the name of Anderson Court, providing office accommodation. “BERWICK SILENTS“ is a history of early cinema in Berwick, from 1895 to 1930. Downloadable from this link as a PDF file. 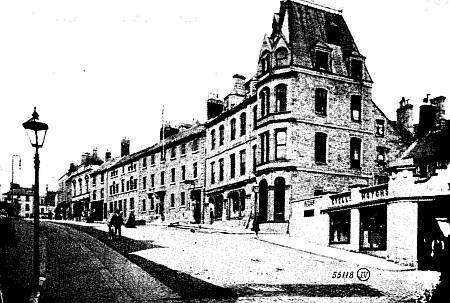 Until 1909, the visiting filmshows in Berwick appeared either at the Queen’s Rooms or at the Corn Exchange. However in November 1909 a new venue was announced, the Central Picture Hall, seemingly intended to serve as a dedicated auditorium for showing films. It was situated at 53 Hide Hill (thus lying between the Queen’s Rooms and Silver Street). The old Salmon Inn Hall, above the Alnwick & Berwick Garage & Cycle Co. which opened around 1907 on the corner of Hide Hill and Silver Street, seems to be the likely location of this venue. It was demolished in December 2015. 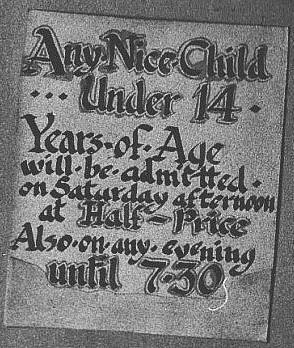 This advertisement for The Playhouse appeared in a town guide of 1920. The growing popularity of the cinema produced a demand for dedicated premises in which to show films, and a wave of purpose-built ‘picture palaces’ appeared around the country during the years leading up to the First World War. In May 1913 it was announced that a permanent cinema was to be built on a site in Sandgate in Berwick. 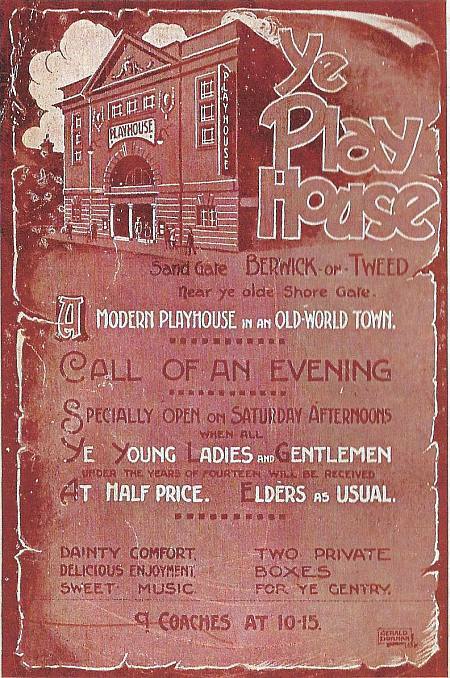 The Playhouse opened for business a year later on 22 May 1914, under the ownership of a company called Pictureland (Berwick) Limited, in which there were a number of local shareholders. The local papers reported approvingly of the new building’s design and decor. “Externally, the ‘Playhouse’ enhances the appearance of Sandgate; internally it is comfortable, well-lit, excellently ventilated. The seating accommodation is of city standard…” (Berwick Journal, 28 May 1914, p.8). “Three huge cement plaques, representing dolphins, mouths agape, adorn the front of the walls…. The whole scheme of decoration in the hall is after the style of Wedgwood, blue and white… Gold and crimson curtains…” (Berwick Advertiser, 8 May 1914, p.6). Now films could be shown all year round on six nights a week (with the occasional variation of vaudeville shows) in a theatre which could accommodate over 1000 people – an astonishing figure when one surveys the limited dimensions of the site today. The launch of the Playhouse sought to emphasise the respectability and high quality of its presentations – with lady attendants in Quaker uniforms, a front-of house commissionaire, and a house orchestra (Berwick Advertiser, 22 May 1914, p.2). Within three months of the opening of the Playhouse, the nation was at war with Germany, and cinema managers were quick to see the opportunities which it gave them to establish a new and patriotic relationship with the public; newsreels and war-related features rapidly became part of the programming. 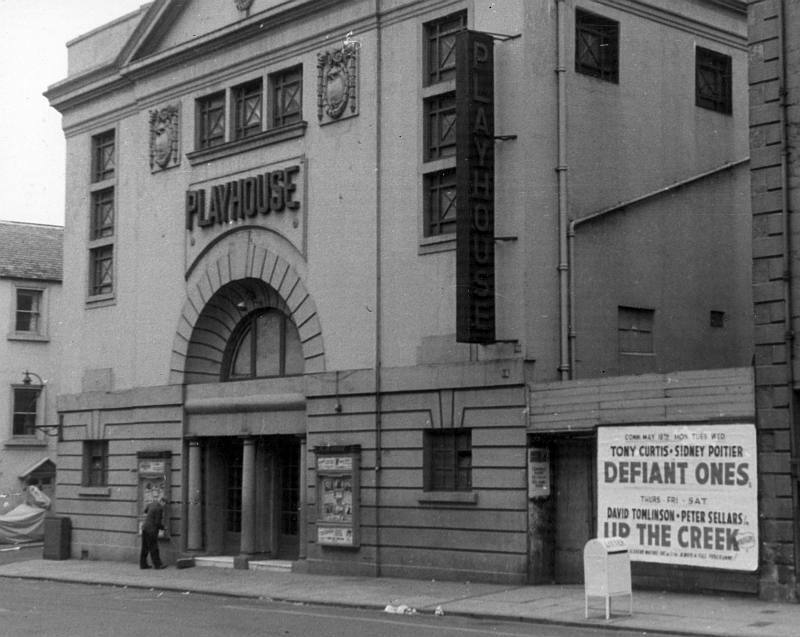 The Playhouse survived the disruption to the film industry which the prolonged war brought about, and it continued to be Berwick’s principal venue for films until 1928 when The Theatre opened and gave it some competition. The Playhouse continued to function as a cinema, while sometimes offering live theatrical performances as well, until 2005; the building was demolished at the end of 2010. 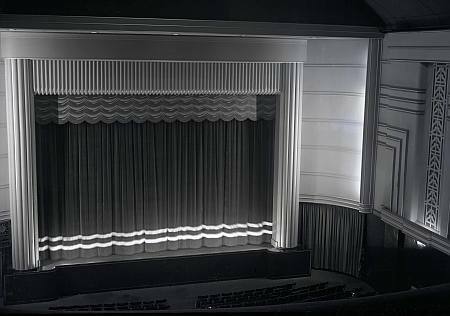 The Theatre remained in business as a cinema, and for live theatre performances as well, for four decades, and its last film screening was in January 1969. In its subsequent history it has been a nightclub (“Caesar’s Palace” in the 1970s) and a bingo hall. In 2015 the building was redeveloped to house a combination of a restaurant, a shop, and residential accommodation. At the end of the 1920s when silent films were giving way to talkies, the Drill Hall was no longer equipped to handle the new medium and the cinema closed for a few years. 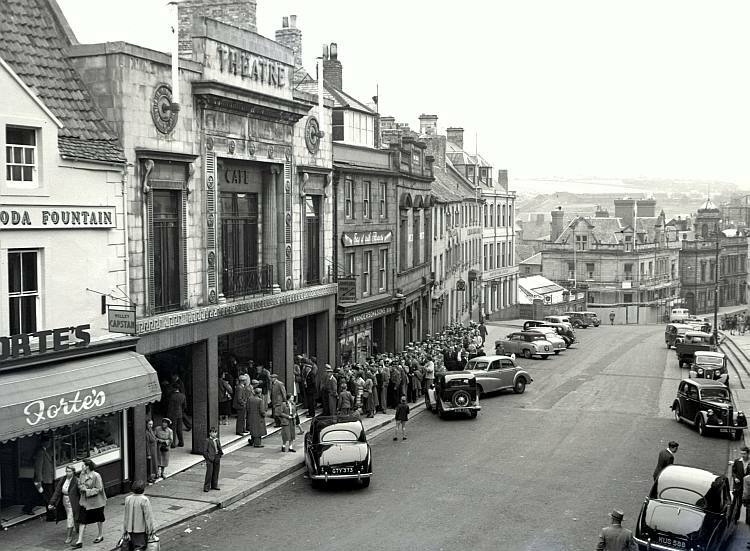 Audiences were tempted further afield to cinemas showing sound films, and Wooler tradesmen began to complain that the Saturday cinema exodus was affecting their business. 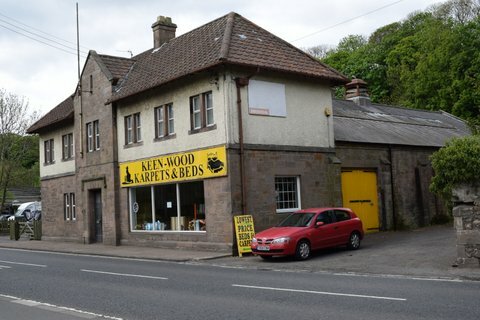 Wooler’s former Drill Hall cinema, now converted for retail. Photo (2016): A. & W. Urwin. Over the years the Drill Hall cinema was known by various names, including the Wooler Cinema, the Eildon Cinema, or just “the Picture House”. By the early 1960s it was, like many others, struggling to retain its audiences, and in September 1961 it closed for the last time. The Drill Hall still stands today on South Road, having served various businesses in subsequent years and now housing a carpet shop. The Maltings opened on 4 April 1990. It was designed as a purpose-built arts complex, built in the centre of the town on the site of an early 19th century maltings which had been destroyed by a fire in 1984. 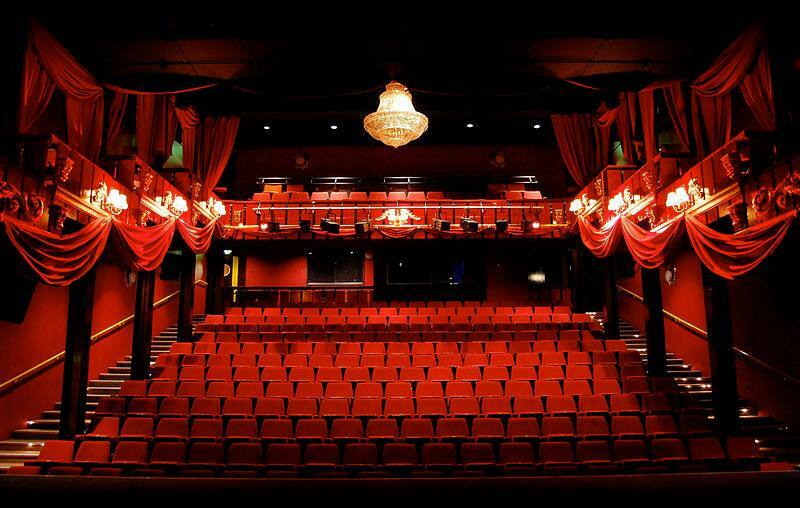 It has a main theatre seating around 300 people, and a flexible studio space which can seat around 70 people; there is also a café and a bar and a number of meeting rooms. Its programme includes both cinema and theatre, and other live events. Banner images: Charles Dickens (Wikimedia Commons); The Theatre (Berwick Record Office BRO 1944-1-647-3); Playhouse film projector (unknown source).